The price is for one bag charm. Material: 100% Cotton. 15 character options. Weight: 100 g. We you reply within 24 hours. 15mm x 12 m. NEW and Of course Authentic. Material: PP Cotton. Weight: 100 g. We you reply within 24 hours. If you do not satisfy with the item. 10 designs. Weight: 10 g. We you reply within 24 hours. If you do not satisfy with the item. Character Family: Sumikko Gurashi. Character: Shirokuma Bear. Product type: Plush Doll. Material: Boa, Polyester cotton. Vendor: San-X Japan. Size: 45×50×75mm / 1.8"×2"×3". We will gladly help you search. 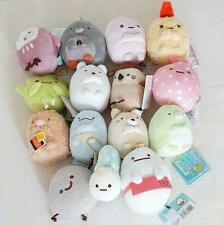 Sumikko Gurashi series "Daifuku". San-X "Sumikko Gurashi". Tapioca x 1. by handling the situation on the your ground. San-X official item! Very cute! Size : 8 × 11.5 × 16 cm. 2 pattern options. The price is for one bag. We you reply within 24 hours. Material: 100% Cotton. Weight: 100 g. We you reply within 24 hours. The price is for one doll. If you do not satisfy with the item. Character Family: Sumikko Gurashi. Character: Tokage Lizard. Product type: Plush Doll. Material: Boa, Polyester cotton. Vendor: San-X Japan. Size: 80×115×160mm / 3.1"×4.5"×6.3". iSTART 121786,1,1,P38550 iEND . NEW Sumikko Gurashi 2019. Tapioca TENORI S tationery. Letter Set KAWAII. нёLLo○｡ﾟ . ｡☆Kawaii~(⊹＾◡＾)ノo. Die cut letter paper 6. Letter paper 12. San-X original genuine April 2019 new release. Character Family: Sumikko Gurashi. Series: Outing. Product type: Plush Keychain. - Plush dolls are not included. Vendor: San-X Japan. Size: 95×80×50mm / 3.7"×3.1"×2". Release: 2019.04.22. ・ (C) TOMY (C) 2018 San-X Co., Ltd. Your country is very far from Japan and it takes long till the item reaches you. As for that in which the prices of goods exceed 100 USD . From my experience it could take 3 to 7 weeks. Middle East. ■ Material Made of polyester. 2 stamp stands ·. Middle East. [Set contents]. Hobby of clay and bake cakes, puffy was clay! than puffy! clay corner life set! (Puffy was clay!) ". Push clay! Release date: 7 / 29 / 2017. Age: 8 years and up. Corner life surely now is the type made popular 8 character set. NEW Sumikko Gurashi 2019. 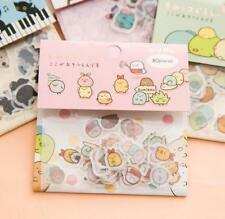 SAN-X Sumikko Gurashi All 6 kinds of charm key fobs. DAGASHI YA sumikko USOKKO OYATSU Key chain. 6 kinds of charm & ball chain. I will not change the tariff declaration amount. ＊ ＊sumikko gurashiFloating SHIROKUMA Key fob ＊ ＊. NEW San-X sumikko gurashi SHIROKUMA White bear. Keyring Charm Key Fob Keychain. Size: H 58 × W 52 × D 23 mm. I will not change the tariff declaration amount. Character Family: Sumikko Gurashi. Character: Tokage Lizard. Series: Shirokuma's Handmade Plush Doll. Product type: Plush Doll. Vendor: San-X Japan. Material: Boa, Polyester. Size: 60×60×60mm / 2.4"×2.4"×2.4". Model: SMG1904. Character Family: Sumikko Gurashi. Character: Tapioca. - Reel strap: ○. Product type: Pass Case. Vendor: San-X Japan. Release: 2019.04.03. We will gladly help you search. Material: 100% pp Cotton. If you do not satisfy with the item. We you reply within 24 hours. Middle East. © 2017 SAN-X CO., LTD.
NEW Sumikko Gurashi 2019. Tapioca Plush Doll TENORI Stuffed Toy. TENORI Plush Sumiko's little house 2019. Sumiko's little house. Very cute little house, just like Tapioca milk tea. San-X original genuine April 2019 new release. - Gather 126 kinds of "Sumikko" characters with traps and items. A new type of erasers sumikko! Glass bottle with cork stopper and 10 pieces of mini erasers. Cute bottle with cork stopper! I will not change the tariff declaration amount. And I will not accept your inquiries or complaints about tariffs. Product number: WL32001. It is a design "tail of the shrimp kakifly errand' wallet. [Cute wallet San-x characters, corner living] popular corner lifestyle series "the tail of the shrimp kakifly errand pattern wallet. ・ Battery not required. ・ Target age: 6 years old and above. Character Family: Sumikko Gurashi. Character: Tokage Lizard's Mother. Series: Shirokuma's Handmade Plush Doll. Product type: Plush Doll. Felt mascot: ○. Vendor: San-X Japan. Size: 155×70×190mm / 6.1"×2.8"×7.5". Pre Sale San-X Sumikko Gurashi Gray Cat neko's brother mini Plush Doll F/S. Middle East. SAN-X Sumikko gurasi Glass jar NEKO Cat. нёLLo○｡ﾟ . ｡☆Kawaii~(⊹＾◡＾)ノo. GLASS CANDY APOTHECARY JAR. The expiry date is 12 May 2019 of candy. Made of body glass, made of lid silicon. It contains several candies made in Japan. Character Family: Sumikko Gurashi. Character: Sumikko Gurashi. Product type: Towel. Vendor: San-X Japan. iSTART 117404,1,1,P37568 iEND . NEW Sumikko Gurashi 2019. Tapioca TENORI S tationery. Set of Notebook with B5 size clear holder (4 1 pocket). B5 Notebook: Stitch bound 7mm 30 rows 48 pages. I will not change the tariff declaration amount. Material:PP Cotton. Size:About 24"(60CM) length. Size: about 95 × 120 × 30 mm. Middle East. Made of cotton cloth glossy lamination.